After an 85-57 beatdown in East Lansing, Indiana returns home tonight to face Maryland. The Terrapins are 15-6 overall and 4-4 in the Big Ten. It wasn’t surprising that Indiana lost on Friday night to Michigan State, but the fact that the Hoosiers never seriously challenged the Spartans in the game’s final 35 minutes was a step backward. Fortunately for Indiana, a quick turnaround provides a chance to put the loss in the rearview as Maryland comes to Bloomington for the first time since March of 2016. The Terps, who are without Justin Jackson for the rest of the season, have lost their last three road games. Indiana’s chances, however, could be largely dependent on the status of Juwan Morgan, who injured his left foot in Friday’s loss at Michigan State. Morgan did not return after leaving the game late in the first half and left the Breslin Center on crutches. Indiana has not given any update on his status for tonight’s game. Without Morgan, Indiana’s already depleted frontcourt will be in for an uphill battle against a Maryland frontline featuring two regulars who are 6-foot-10 and 7-foot-1. Like Indiana, Maryland has a depleted rotation because of injuries. Jackson, the team’s most talented player, is out for the season with a torn labrum. Another rotation player, junior Ivan Bender, is also out for the season with a torn meniscus in his right knee. Despite those setbacks, the Terps have the talent to rally and contend for an NCAA tournament berth. Maryland’s backcourt is one of the league’s best with sophomores Anthony Cowan and Kevin Huerter. Cowan is arguably the Big Ten’s best point guard and is averaging a team-best 16.3 points per game. 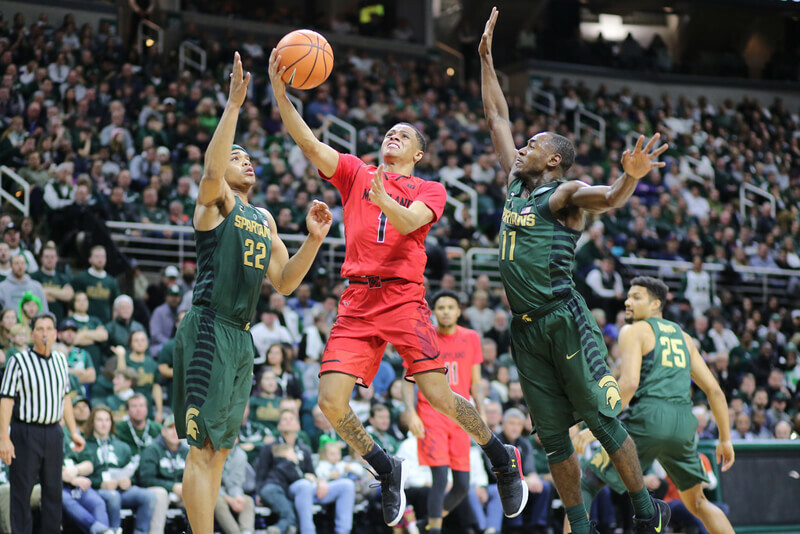 Cowan is a deadly threat as the ball handler in pick and roll situations, according to Synergy Sports. In 85 pick and roll possessions, Cowan has scored 91 points, which ranks in the 93rd percentile nationally. Cowan’s overall field goal percentage isn’t great (41.3), but he’s a good 3-point shooter (41.1 percent). He’s also terrific at drawing fouls and getting to the line. Cowan’s free throw rate (FTA/FGA) is 66.2 percent and he’s shooting 85.2 percent from the stripe. Huerter is one of the Big Ten’s best shooters and the team’s second leading scorer at 14.1 points per game. Huerter ranks in the 94th percentile nationally in spot-up situations, according to Synergy and he’s shooting 46.8 percent on 3s. Given Indiana’s history of giving up clean perimeter looks this season, Huerter is a critical matchup. Freshman Darryl Morsell starts in the backcourt and is a solid defender who can get to the rim. The 6-foot-4 guard isn’t a perimeter shooter (3-of-18 on 3s), but has a free throw rate over 50 and is knocking down 72.6 percent of his attempts from the line. Junior Dion Wiley, who has battled injuries throughout his career, comes off the bench and is another 3-point threat for the Terps. Wiley is shooting a solid 38.3 percent on 3s and averages 5.4 points in 19.8 minutes per game. Senior Jared Nickens, a 6-foot-7 wing, also comes off the bench and is a capable threat from distance (39 percent). The Terps frontcourt consists of 7-foot-1 senior Michal Cekovsky, 6-foot-10 freshman Bruno Fernando and 6-foot-9 redshirt freshman Joshua Tomaic. Fernando ranks in the top 10 in league play in both offensive and defensive rebounding and is making 54.7 percent of his 2s against Big Ten opponents. Cekovsky is shooting 69.3 percent from the field and is in the top ten in Big Ten play in block percentage. Tomaic has been playing more recently with Bender and Jackson out and has given Turgeon some solid backup minutes at the four. He’s averaging 3.5 points and 2.5 rebounds in 10.5 minutes off the bench. As bad as Maryland looks on paper defensively, the numbers are a bit skewed as four of their eight Big Ten games have come against Purdue, Michigan State, Ohio State and Michigan. Maryland is improving defensively and nearly pulled off a win last Monday against Michigan at the Crisler Center. The Terps are excellent on the defensive glass, which could be a problem for Indiana. When the Hoosiers are playing well offensively, second chance points are typically a part of the equation. Maryland is currently allowing Big Ten teams to shoot 45.3 percent on 3s, but can Indiana make its open looks from the perimeter? The free throw situation also looms large as Maryland is the Big Ten’s second best team in terms of getting to the line and the best at keeping its opponents off the line. Given Indiana’s limited depth up front, the Hoosiers simply can’t afford foul trouble and expect to win. Ken Pomeroy’s ratings like Maryland by three with just a 40 percent chance of Indiana pulling off the upset. Sagarin’s ratings like the Terps by just 2. The Vegas line, which opened with Maryland as a two-point favorite, has shifted several times as of this morning. Beyond the uncertainty of Morgan, this game is probably going to come down to how well Indiana can contain Cowan and Huerter. Maryland is capable of getting hot from the perimeter and Indiana has at times been unable to stop teams when they get rolling from distance. Indiana has been good at home in league play so far (3-0), but the level of competition ramps up tonight on Branch McCracken Court. Will the Hoosiers be able to continue holding serve at home? Simple; Maryland throws it over the heads of IU’s short front court. IU gets in quick foul trouble trying to stop them. It’s going to be a tough battle without Juwan Morgan, I still can see us winning the game if players like McSwain and Clifton Moore provide us with quality play. I have to agree. It is so frustrating to look at our roster and not see any size. DD was our only player with any size. Now we are starting 6’7″ Juwan when healthy and first sub is 6’6″ Freddy as his backup. Maryland has 7’1, 6’10”, and 6’9″ across the front line. Even as excited as we are for our recruits next year, we still don’t have much size coming with one 6’10” player in the mix. I understand that there are limited bigs and everyone wants them but it also seems like everyone else gets them. This will be a close game. I assume JM will play. This will be a good test to see if we belong in the middle of the Big Ten. I like the progress this team has made. MSU was simply too talented. This match up is closer and I think IU wins by 2-4 points and plays with a lot of energy. While this year’s team is quite undersized, we have actually had quite a few good bigs in recent years. Last year we had TB and DD. The year before we had TB and MB (wouldn’t you love to have Max this year?). In the years before that we had Noah Vonleh, Cody Zeller, and Christian Watford (not to mention busts like HMP and PJ, who came here with some degree of hopefulness). Also worth pointing out that size is helpful, but not necessary. The #1 team in the country has nobody taller than 6’9″. West Virginia has two guys 6’10” or better, but they are the bottom two guys on their roster. Purdue is better this year that it was any year with Swanigan or Hammons. On the other hand, Kentucky has 6 guys 6’9″ or better, and is basically .500 in conference play. We are at an extreme right now, and with no DD and no JM we will be overpowered by big front lines. But even that could be overcome if we had good guard play, which for the most part we do not. This is just a depleted roster, and we are more than a year away from a meaningful fix. IU needs to shoot the ball well to win tonight. I would love to see Green step up. The talent is there. A small team can beat a much larger team no question but in order to do that they must shoot well, extend the floor, and force turnovers. I do not think we will out rebound a solid rebounding team but we can get in there face and force poor decision making. We don’t have a lot of big guys and if we don’t have JM in the game it will be tall order but we have big physical guards which causes a miss match as well. We will see us holding home court on this one. Race Thompson plays a rugged style and moving in on 6’9″, 230 I suspect…nothing to sneeze at. Not sure that we have bigger guards than Maryland. With the exception of their point guard, their other guards are 6’4″ – 6’7″. Excited to see Race next year but haven’t seen any rating of him putting him at 6’9″. Have you seen some release that he is continue to grow? ya, the season is starting to feel like we should get some of the younger guys substantial playing time to get them some experience and see what they are capable of doing. if JM is out for extended period, this is definitely the case. Pure speculation on my part due to his age, I figured he may grow 1 more inch and then put on some weight due to his time with the training staff. He does play kind of a brawler style though looking at video from his junior year. I’ll agree the lack from size doesn’t mean you can’t perform well or win a championship, but I think without size, you must have another outstanding characteristic. Villanova is one of the best shooting teams in America and West Virginia plays defense at an extremely high level. Kentucky has the youngest team they’ve ever had and the weakest guards I can remember. Your Purdue claim doesn’t make much sense because they have a 7’2″ player and a 7’3″ player. When Hammons and Swanigan played together, they ended up 26-9 in a much stronger B1G and lost to MSU by 4 in the B1G tourney finals. Maybe not great, but not too bad and we have no idea how this year’s team will end up. Both Haarms and Haas are decent players and play significant minutes. You can bet they will be used relentlessly against us next Sunday. I will agree with one thing you said, our guard play has not been strong and next year looks down right scary. I understand that size doesn’t guarantee being competitive, but will say that Villanova has 5 players that are 6’9″ on their roster (one is redshirting). Perhaps that is the way we go as well under Archie. I think if JM plays at a decent level, you’re way off. If he doesn’t play, you may be able to fill any name in for Maryland (above) and it would be true. The one good thing about playing Maryland is their poor defense. They gave Michigan a good game, but UM was coming off the MSU win, which always means a huge letdown. UM still beat them, playing at about 3/4 speed. Neither of Purdue’s bigs are in any way comparable to Hammons or Swanigan. Both are in the NBA, and yet Purdue got better with their departures. Purdue is still big, but less skilled inside, but is excelling because of guard play and other factors. And since that was the point of my post, your apparent counterpoint about Kentucky, Villanova, etc. isn’t a counter at all. You are just saying what I said: things other than size matter. Between the size disadvantage, and Maryland’s proven ability to both not foul and draw fouls, it’s going to be though for us to win. Don’t be surprised when there’s a foul disparity, even at home given these factors. I think if Juwan is healthy, we can win this game. I’m not expecting this to be the case though. I have seen Maryland play a couple times this year and there guards just aren’t as physical as our guys. Kevin Huerter is 6’7″ but only 190 lbs I’m sure RJ would get the task on Huerter – RJ is 6’3 195. At the PG Maryland is very good but Cowan is 6′ 170 and I am sure JN would get the assignment at 6’1″ 195. Both RJ and JN are fast physical defenders that are not likely to get beat off the dribble. If JM is healthy I like our chances. Once again I am a homer I always see the “W” and I do think we have a couple more advantages. Home crowd and we have to prove a point after a disappointing beat down. It will be a “W” at Assembly Hall. Trying to guard Cowen and Huerter would be reason enuff for a foul disparity. LOL. Normally I don’t like your posts but this was F.U.N.N.Y. Never so happy as to eat crow on a post! This crow tastes ever so sweet! LOL. Although I posted my opinion thinking JM would not be playing, it doesn’t matter.